BE WATCHFUL and diligent in God’s service and often think of why you left the world and came here. Was it not that you might live for God and become a spiritual man? Strive earnestly for perfection, then, because in a short time you will receive the reward of your labor, and neither fear nor sorrow shall come upon you at the hour of death. One day when a certain man who wavered often and anxiously between hope and fear was struck with sadness, he knelt in humble prayer before the altar of a church. While meditating on these things, he said: “Oh if I but knew whether I should persevere to the end!” Instantly he heard within the divine answer: “If you knew this, what would you do? Do now what you would do then and you will be quite secure.” Immediately consoled and comforted, he resigned himself to the divine will and the anxious uncertainty ceased. His curiosity no longer sought to know what the future held for him, and he tried instead to find the perfect, the acceptable will of God in the beginning and end of every good work. 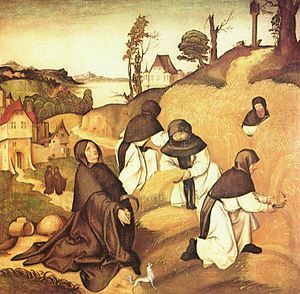 “Trust thou in the Lord and do good,” says the Prophet; “dwell in the land and thou shalt feed on its riches.”88 Ps. 37:3. There is one thing that keeps many from zealously improving their lives, that is, dread of the difficulty, the toil of battle. Certainly they who try48bravely to overcome the most difficult and unpleasant obstacles far outstrip others in the pursuit of virtue. A man makes the most progress and merits the most grace precisely in those matters wherein he gains the greatest victories over self and most mortifies his will. True, each one has his own difficulties to meet and conquer, but a diligent and sincere man will make greater progress even though he have more passions than one who is more even-tempered but less concerned about virtue. Two things particularly further improvement—to withdraw oneself forcibly from those vices to which nature is viciously inclined, and to work fervently for those graces which are most needed. The religious who concerns himself intently and devoutly with our Lord’s most holy life and passion will find there an abundance of all things useful and necessary for him. He need not seek for anything better than Jesus. Always remember your end and do not forget that lost time never returns. Without care and diligence you will never acquire virtue. When you begin to grow lukewarm, you are falling into the beginning of evil; but if you give yourself to fervor, you will find peace and will experience less hardship because of God’s grace and the love of virtue.